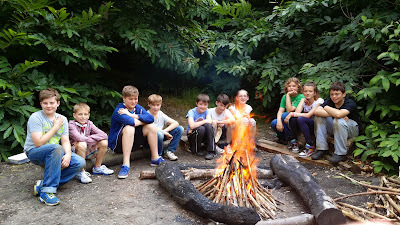 1st Marks Tey Scouts had a marvellous time at Thorrington during the first weekend of July. A great camp. Well done to all of our Scouts who attending the St. George's Day Parade through Colchester Town at the end of April. One of the scouts was also collecting sponsorship for "Below the Line" Poverty challenge raising funds for the "Save the Children"
A warm welcome to our seven new Scouts who joined taking our troop numbers up to 27! 1st Marks Tey Scouts had a wonderful evening 20th December 2012, collecting charitable funds for Help For Heroes along with the Beavers and Cubs. This involved going around the Marks Tey estate pulling a sledge and playing loud Xmas music. Father Christmas joined us and a grand total of £325.05 was raised. 1st Marks Tey Scout Group has just spent a fantastic weekend at Thorrington Scout Camp. We met on Friday evening and played lots of games. On Saturday we went orienteering in the morning and then in the afternoon did rifle shooting, boulder climbing, 3D maze and an assault course. On Saturday evening we had Xmas lunch!!! and than watched a film on a large screen (popcorn included). On Sunday we went on a treasure hunt and then all went home at Noon. On Sunday afternoon all of the Leaders went to sleep!!!!!!!!! !